Intensive driving crash course from OK Driving School. 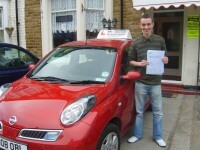 Expert driving lessons excelling to a fast pass in 4 days. 98% pass rate on all driving courses. This is Conor Fenton who joined us with no previous experience on his 17th birthday and passed both his theory and practical driving test in FOUR days. He joins the ranks of one of the youngest drivers in the U.K. proving without question the value of an OK Driving Course. Why choose an intensive course? Giving us an extra chance to ensure you pass FIRST time and to celebrate the successful take over we have decided to give you a £10 discount if you book online. OK Driving School has to put together a vigorous selection of driving courses specifically established to train learner drivers to the highest standards of competence and safety. Our goal is to train each new learner driver the skills required by the Driving Standards Agency syllabus to drive proficiently within the shortest time possible. Throughout the intensive driving course you will receive the very best training, teaching you to carry out set manoeuvres to the criteria laid down by the DSA. Each of our tutors is qualified to the highest levels of driving. Our high-grade professionals will teach you all aspects of driving including the different types of road environments combined with dual carriageways. For ease of control we run a fleet of popular Modern cars. These cars include both Manual and automatic models. We ensure you are provided with the very best in driving tuition from an elite team of professional instructors. For the finest driving tuition, first class accommodation and the best value for money there really is only one choice! OK Driving Courses - The fastest growing and best intensive course specialist. Why choose an intensive course (Crash Course)? Since the new format and non-publication of theory questions introduced in April 2014, many candidates are concerned about the theory element of the driving test. We at OK Driving courses have set up specialised training for all our students, by commissioning extra training for our instructors in this element. We enjoy a 98% pass rate. Extra facilities are available for those with learning difficulties. Where do the driving courses take place? Driving test waiting times are kept to a minimum because of our accessibility to the various Driving Test Centres within a reasonable driving distance from Blackpool. You will experience such wide and varied traffic conditions in the area, our courses will stand you in good stead giving you confidence to handle any motoring situation you may encounter. So you want your freedom? You no longer want to rely on family and friends to drive you around or use public transport. You have just lost your job and need an edge on others by having a driving licence in applying for a new position. The intensive driving course in the last few years has risen dramatically, so much so that we have huge selection of intensive driving courses on offer. OK Driving School prides itself on offering driving crash courses that manages your time effectively by inserting the required time needed to learn to drive according to the DVLA into 3 days, a week or 2 weeks of jam packed learning and practice, so you never have to stop and start or in driving terms stall! Driving standards are indeed varied. Most are novice learners but it is astonishing how many good drivers are driving illegally. Some people think that just because they purchase insurance and declare a driving licence that they are never going to need a driving test. With the new enforcement technology the police are rapidly detecting unlicensed motorists. So if you are one of these people the simple truth is that your insurance is also void. Driving courses offer you the chance to become legal virtually overnight. Think about it no more looking over your shoulder or driving in fear of "is this the day". We do not judge you so we will in fact welcome you on our driving courses. We have a specially designed driving course that includes the theory test. Residential driving courses are on the increase allowing the individual to go away and stay in a hotel for a week so they can concentrate on learning to drive without any distractions of modern life. OK Driving School offers a range of deals which includes 1 weeks stay in a comfortable hotel in Blackpool. Fast pass driving courses are designed to make learning to drive easier for you so all you have to think about is your driving and passing your test. 2) taking a four day driving course and being legal? A driving crash course is now one of the most popular, fastest and efficient ways to learn to drive. Driving once a week for a year is not only time consuming, but also frustrating when you forget what you learnt the week before. With OK Driving School your learning stays fresh, giving you the confidence to drive and be successful. Put a side a week to learn how to drive, take your theory and practical test.